Jamaican sorrel is an unmistakeable symbol of Christmas on our island. Distinctively flavoured, with a delicate aroma and a rich crimson colour, Christmas wouldn't be Christmas without this favourite Jamaican drink. 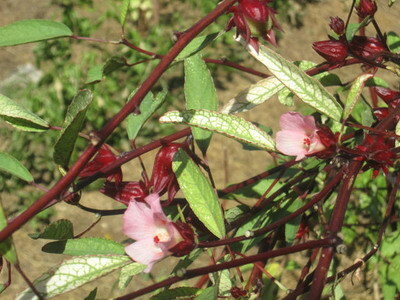 The sorrel plant is a member of the Hibiscus family. The red variety was introduced into Jamaica by the British in the 17th century. 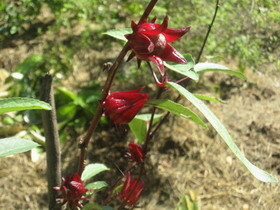 Sorrel is a shrub which bears small pink flowers. The pictures below show the flowers, and the fleshier sepals which turn red when the plant matures, usually between November and December. 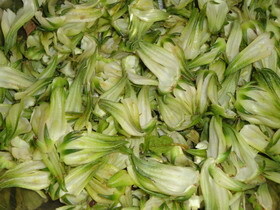 It is these sepals that are removed from the stalk, and used as the essential ingredient for the drink we love so much. 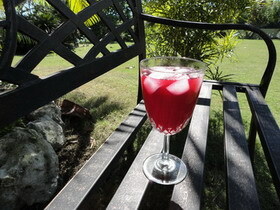 Here is a recipe for Sorrel. The quantities need not be strictly observed - if you were to do a survey of all the households in which the drink is made, you'd be unlikely to get matching quantities out of any two! Wash and peel, then grate the ginger. Place grated ginger, water and pimento in a large pot, and bring to a boil. Let boil for 5 minutes. Wash the sorrel and add to the pot. 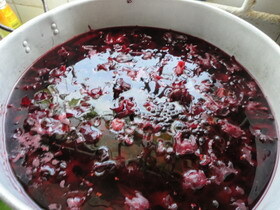 Ensure there is enough water to cover the sorrel. Let boil for another 5 minutes. Turn off the heat, and allow the mixture to steep (or draw, as we say) for 12 to 24 hours. After the mixture has steeped, strain the off the liquid and discard the sepals. Sweeten the liquid with sugar to taste, and add rum if desired. Refrigerate and serve chilled. Sorrel can be used to make tea, jam and chutney. A white variety of sorrel is now available, but I doubt it will ever replace the red sorrel that has become so entrenched as part of Christmas in Jamaica. Sorrel is bottled and sold year round in supermarkets. Very tasty, but it's not quite the same as drawing it in your kitchen at Christmas, or having a friend give you a home-made bottle as a Christmas gift. The health benefits of Jamaican sorrel seem to be numerous. It contains flavanoids, compounds which are antioxidants. These help to deter certain cancers, bolster the immune system, and promote youthful looking skin. Sorrel is a good source of Vitamins A and C.
It's great that something so delicious is healthy as well! I'm actually sipping some as I close this page. Try it soon if you haven't already.